A scrubber cleaner, also known as a floor scrubber, is a machine with a moving brush, which scrubs hard floors to clear away dirt marks and debris. It may be ride-on or walk-behind, offer wet or dry operation, and may be capable of buffing or other functions. On ArchiExpo, these machines are arranged by function or type. 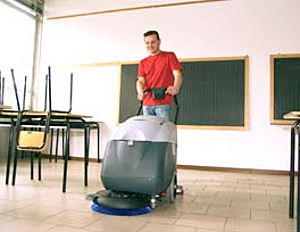 Scrubber cleaners are normally designed for high-traffic areas such as train stations, schools, libraries, hospitals or exterior public spaces. Ensure that scrubber capacity and operation are suitable for the size of the space to be cleaned the type of floor. A ride-on model may be more suitable for large areas, while walk-behind versions are appropriate for smaller surface areas. Consider the scrubber power source, noise level and operational autonomy between recharging or refueling. Vacuum unit capacity or storage for the cleaning solution also must be determined. Ease of maintenance and operation, and length of guaranty and warranty are other important factors.